Automotive diagnostic industry leader CarMD ranks each state on the average cost to repair check engine light-related issues, including parts and labor, as well as year-over-year trends. This annual index is published to help educate vehicle owners and the industry about check engine vehicle health. For the third consecutive year, Michigan is the U.S. state with the lowest average check engine light repair cost ($333.26), according to automotive diagnostic industry leader CarMD.com Corporation, which analyzed data from more than 10.7 million vehicles needing repairs in 2017 to verify this statistic. Rounding out the five most affordable states for car repairs were Ohio, Maine, Wisconsin and North Dakota. Findings also determined that vehicle drivers in the District of Columbia (D.C.) incurred the highest average cost ($402.92) including parts and labor to address the pesky check engine light. 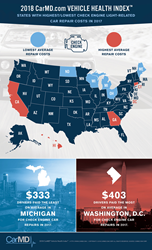 After D.C., the most expensive states/districts for car repair last year were Georgia, Connecticut, Hawaii and California. A leading provider of automotive diagnostic data and business solutions, CarMD.com Corporation publishes this annual state-by-state ranking as part of its CarMD Vehicle Health Index to bring awareness about the importance of check engine light health in order to reduce cost of ownership. Car Repair Costs are Down Slightly: The average cost to repair a check engine light in Michigan in 2017 was $333.26, which was 3 percent lower than the previous year when drivers in Michigan paid $343.40 on average. In D.C., where check engine repairs were highest in 2017 at $402.92, this is still 2 percent lower than in 2016 where the average cost for parts and labor was $410.98. Labor Costs: For the second consecutive year, Vermont vehicle owners had the lowest average labor cost ($121.98). This is not surprising since the most common cause of a check engine light on Vermont cars and trucks was a loose or missing gas cap, accounting for 7.5 percent of repairs. Drivers in D.C. paid the most for labor ($141.32). Type of repair, how long the repair will take and the shop’s hourly rate can all factor into the average labor cost. Parts Costs: Drivers in D.C. also paid the most on average for parts ($261.60), while drivers in Michigan paid the least for parts ($194.43). The most frequent repair in D.C. was to replace a catalytic converter, accounting for 6.3 percent of recommended repairs in D.C. The catalytic converter is a part that costs $1,037 on average and usually only fails due to age or when another needed repair such as spark plug replacement is ignored for too long. Type of vehicle, type of repair and whether original equipment (OE) parts are used factor into the average parts cost. Biggest Jump: Hawaii saw the most significant increase in ranking moving from the state with the fourth lowest to the state with the fourth highest repair cost with a 12 percent increase in average repair cost. One factor in this increase was a rise in the number of mass air flow and catalytic converter repairs, which can be pricey fixes that drive up the average repair cost. CarMD’s state ranking of repair costs was derived from analysis of 10,705,587 needed repairs identified for model year 1996 to 2017 vehicles from Jan. 1, 2017 through Dec. 31, 2017 reported to and analyzed by CarMD’s nationwide team of ASE-certified technicians. All 51 U.S. states/districts, including the District of Columbia, are represented in this Index. The repairs are related to a vehicle’s on-board diagnostic (OBD2) system, which is standard on all vehicles manufactured since 1996. It monitors emissions-related systems within a vehicle, triggering the check engine light when a problem occurs. CarMD does not report on problems that are outside the scope of a vehicle’s OBD2 computer monitoring such as tires, and mechanical parts like belts and hoses. Headquartered in Irvine, Calif., CarMD.com Corporation is a leading provider of automotive diagnostic business solutions, digital automotive aftermarket platform services and data licensing. CarMD specializes in automotive technology services that leverage and empower the capabilities of the on-board diagnostics (OBD2) port. CarMD has worked with a network of ASE-certified technicians to build and validate the most comprehensive database of OBD2-related expert repairs and associated costs from which CarMD draws its Vehicle Health Index™. This Index is released each summer to provide vehicle owners and the industry with a state-by-state analysis of car repair trends and costs. For information on CarMD’s products and third-party software service solutions, visit http://www.carmd.com.